This recipe is a little bit more involved than my Fruit Flavoured Icecream, but is worth the effort for a special occasion. Beat egg yolks, stevia and vanilla essence until thick. Heat cream, coconut cream, and chocolate until chocolate has melted through. Add cocoa and mix well. Add chocolate mixture to egg mixture and mix well. Return mixture to the pot and heat gently, stirring continually until mixture has thickened. Remove from heat and cool. When cool put mixture into ice-cream maker for 30 minutes or until thick and nearly frozen. Serve immediately. 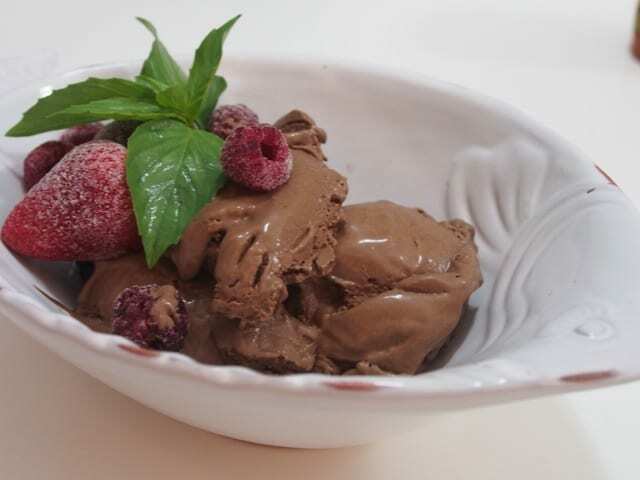 If you do not own an ice-cream maker, freeze cooled mixture. When nearly frozen put mixture in a blender and blend until creamy. Serve immediately. This recipe is actually quite high in carbs, due to the cocoa and dark chocolate. Very dark chocolate has some of its own health benefits; lowered blood pressure and improved insulin resistance.